Just before we arrived at Worthing Pier, we passed what I thought was a small terrace of concrete beach huts, but which turned out to be the Coast Cafe Artists’ Studios. There are only a few of them – perhaps 5 or 6. Outside one of them some paintings stood displayed on easels. I was immediately drawn to them; they were incredibly good. One was of faceless scarecrows dancing around a fire at night. The deep colours radiated a warmth from the canvas, conveying heat from what was obviously a summer’s night and also from the fire they were dancing around. As some of the scarecrows danced, others played fiddles and other instruments. The scene was inviting, almost beckoning the viewer to leap into the canvas and join in. And yet there was something eerie and menacing at the same time; as the scarecrows had no faces. As much as the dancing looked a lot of fun, it was best observed unseen, from afar. It was a private dance; faceless scarecrows only. I was tempted to take photos of this and other paintings, and I suppose I should have asked the artist, David Barber, because he was there. However, I always feel that taking photographs of paintings is something of a taboo. 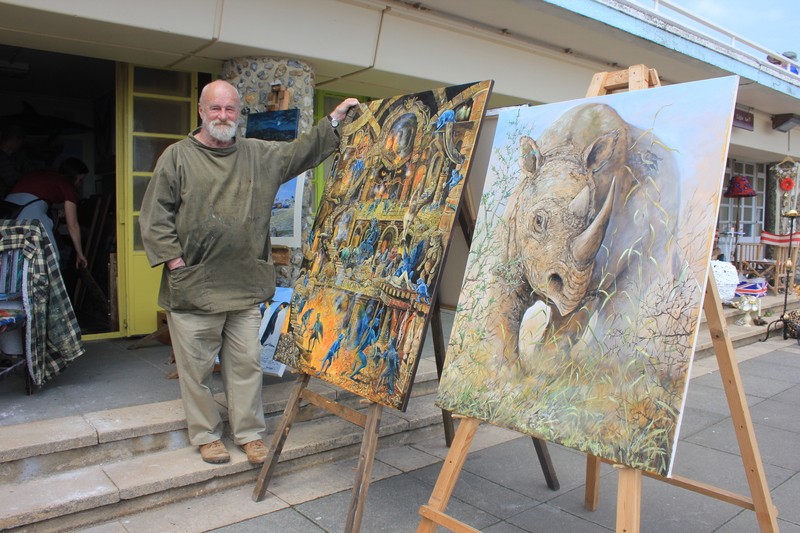 I did take one photo, of David Barber himself with two of his paintings – a rhinoceros and next to it a depiction of Hades. This latter one, on which the artist is resting his hand, was beautiful and yet ghastly in equal proportions – impish, you might say! Again, it was very pleasing to the eye, yet with closer observation there were all sorts of menacing and darker undertones (much as you would expect, of course, from any depiction of Hades!). This entry was posted in West Sussex and tagged art, coast, David Barber, travel, walking, west sussex, worthing. Bookmark the permalink.